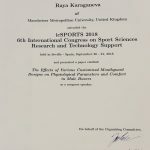 The ISEA student engagement award enabled me to attend the 6th International Congress on Sport Sciences Research and Technology Support by covering the travel and accommodation costs. This year, University of Seville was chosen to host the conference on 20-21st September. Injury prevention in sport was one of the topics included in the programme, which directly correlated to my work on sports mouthguards. Being towards the end of my PhD, it was valuable experience to present part of my research at an international conference and exchange ideas for potential collaboration with other professionals in the field. The feedback I received was very encouraging and further motivated me to continue my work. The conference was very well organised and interactive. All delagates managed to create both very friendly and professional environment during the lecture sessions, which helped creating interesting discussions. Also, everyone who presented a poster had the chance to tell us more about it in 5-10 minutes. I thought this was a very good approach to run the posters session. This gave me the chance to meet and exchange contacts with someone who wants to start similar research to mine. Additionally, talking to other PhD students and academics from countries such as Australia, Norway, Ireland, Japan, Portugal, Russia and more allowed me to learn more about various experiences in academia and career in research at other parts of the world. I would like to thank the ISEA for giving me the opportunity to present my work abroad. 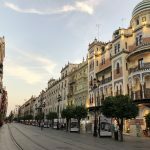 I managed to create some new contacts and had a great time visiting Seville.